Rainhill remembers in . . .
Alexander Ramage was not a Rainhill man having been born in Leith, Scotland. However during the war he was seriously injured and was returned to England. He was sent to the VAD Hospital at Oakdene at the junction of Owen Road and Lawton Road but sadly died from his injuries. Alexander also appears in the section Soldiers at Rainhill Hospitals. He is buried in St, Ann’s Churchyard either at his family’s request, perhaps because they could not afford to pay for his body to be returned to Scotland, or because they could not be contacted. See Alexander's record on the Commonwealth War Graves Commission (CWGC) website. 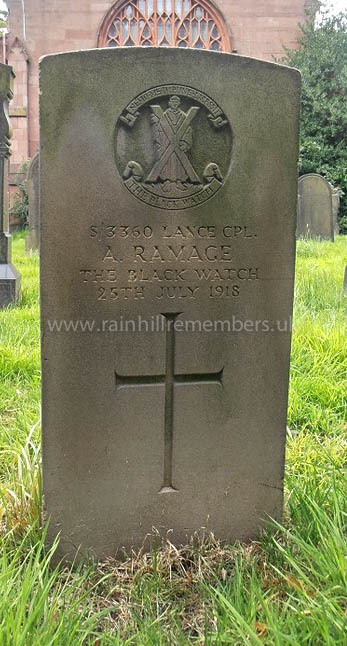 Headstone of Alexander Ramage standing near the east window of St. Ann's, Rainhill.